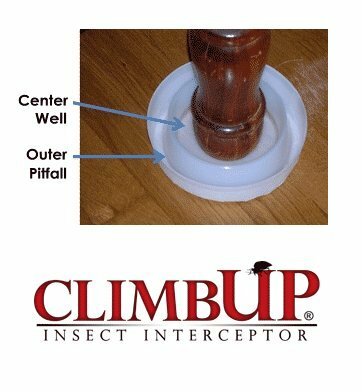 CLIMBUP™ insect interceptors are part of our bed bug treatment protocol for use during an infestation. They monitor for bed bugs allowing the user to know not only if they have bed bugs, but also how bad the infestation is and when they are finally gone. They are designed to intercept bugs leaving the bed or attempting to enter. Climbup Interceptors are easy to apply and should be re-applied with talc powder every few weeks using a small cotton ball. Talc can be purchased for a few dollars at any CVS or Walgreens. Remember that every bug that is intercepted by the climbup interceptor is one less bug that can reproduce or feed on a sleeping person. In order for these devices to work to their optimum potential, what must I do? 1. Do not let any items (i.e. comforters, sheets, clothes, etcÖ) hang off of the bed and touch the floor at any point during the day or night. 2. Do not allow the bed to contact the wall. 3. Check the devices periodically to evaluate if bugs are present or if the devices are compromised (broken, debris in the wells) in any way. This situation will not allow the CLIMBUP™ to work properly. This situation will optimize the CLIMBUP™ effectiveness. Between the carpool and the couch cushions, you’re the CEO of the home front. Take care of your family – and take care of business, no matter where household pests rear their ugly heads. Show bugs who’s boss with Hot Shot insecticides. They’re your weapon of choice, giving you the clear advantage within your walls and at the bank. Save the day. Hot Shot Bed Bug Glue Trap provides an easy way to detect whether bed bugs are in your home. These disposable, ready-to-use traps detect bed bugs where they live and travel. These traps work best when placed in areas where bed bugs hide, such as on furniture and bed frame legs, between the mattress and box spring, on the floor and under furniture. This pesticide-free glue trap has a multifunctional design that helps provide early warning of bed bug infestations. When a bed bug is seen in the trap, begin the treatment process with Hot Shot bed bug control products. These traps are disposable – replace as needed. Check the trap at least once per week for evidence of bed bugs, such as small, reddish-brown bugs the size of an apple seed, small blood stains or dark excreta spots, dead bed bugs, shed skins or small, whitish eggs. Bed bugs are attracted to porous materials with many crevices where they can hide. 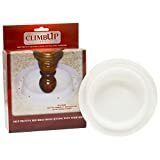 The textured base of the Disposable Detection Trap allows bed bugs to easily climb up into the trap, attempting to find a hiding spot, where they become trapped on the glue strip. Place between your box spring and mattress, seat cushions or on the ground near your bed for effective bed bug monitoring and trapping.